Muraho and greetings from the Church of the Brethren in Rwanda! Since August 2018, Global Mission and Service made it possible for my family to live in the beautiful country of Rwanda and to be a part of the budding ministry God is blessing here. The Church of the Brethren in Rwanda is nearly four years old. In that short time, God has worked mightily and there are already four congregations in the western part of the country. More recently, however, the government has imposed strict guidelines for churches, which has been a significant challenge. Every week, hundreds of churches are being closed throughout the country. In response, the people of our churches gathered last November and gave sacrificially to raise nearly $3,000 (exceeding their original goal of $2,000) to begin improving their properties. Inspired by this act of faith by the Rwandese Brethren, many brothers and sisters in the US also have chosen to support these efforts. 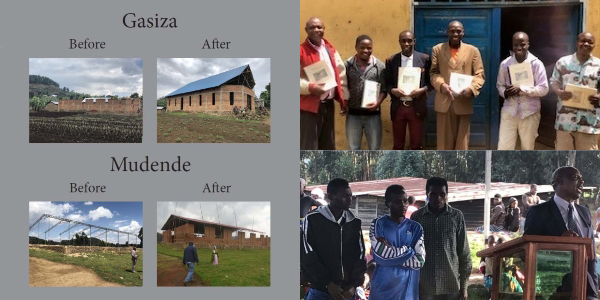 As a result of this faithful giving and partnership, our churches in Gasiza and Mudende have been able to improve their worship spaces (above, left). The Brethren in Gisenyi also purchased land in hopes of building a denominational headquarters. This will be very important as we work to be recognized as a denomination by the national government. The recognition process has been arduous, but we have made progress and moved to the regional level. Praise be to God! God is blessing the church in Rwanda through the teaching of Brethren beliefs. Even though new ideas are generally met with skepticism, the people have been really open to Brethren theology. We have assured them that our beliefs and practices aren’t new, simply new to them. Several leaders from each church have been trained with the help of Brethren Beliefs and Practices, authored by Galen Hackman in collaboration with EYN (Ekklesiyar Yan’uwa a Nigeria– Church of the Brethren in Nigeria), which recently was translated into the local language of Kinyarwanda. These leaders were trained so that they can lead small groups from their congregations through the book (top right). As a result of these teachings, we have had two occasions for baptisms at Lake Kivu, which include multiple people from each congregation accepting Jesus, embracing the new way, and experiencing trine immersion. We are also planning the first Brethren love feast in Rwanda, one for Gisenyi and Gasiza and another for Humure and Mudende, to take place near the Easter holiday. We also celebrate the ability to send three young Batwa men to university. The Twa are typically an underserved group, but the congregation in Mudende has taken great efforts to make them feel part of the faith community, to share how God loves them and we love them, and to reveal how they can accomplish anything with God’s help. Most Batwa don’t dream of finishing primary school, let alone secondary school, so for a few to go to university is truly a miracle. The three were recognized by pastor Etienne Nsanzimana, founder and overall leader of the Church of the Brethren in Rwanda (bottom right). In the great tradition of being “blessed to be a blessing,” the village of Batwa has gone to another indigenous village to encourage them with the gospel of Jesus Christ and the love the Brethren have for them. This new group of about 20 Batwa has started attending the Humure congregation. This is what kingdom building is all about! Through the ministry of Global Mission and Service and with God’s blessing and grace, all these things have been possible. Thank you for your continued support of all the Lord is doing globally through the Church of the Brethren. On behalf of myself, my family, and our Rwandese brothers and sisters, thank you! Learn more about the work of Global Mission and Service at www.brethren.org/global or support it at www.brethren.org/givegms. This entry was posted in eBrethren, General and tagged Global Mission and Service, Rwanda by eBrethren. Bookmark the permalink.